Graham Swift’s latest book has been very widely reviewed so I’ll keep my thoughts about Mothering Sunday brief. Everybody seems to love it, and I think that is because it is a clever inversion of Upstairs Downstairs clichés. Though Beechwood’s housemaid Jane Fairchild is a foundling with no mother to visit on Mothering Sunday 1924, and her lover Paul Sheringham is the wealthy heir to the Niven Estate, Jane is never a victim. While it’s true that money changed hands when their affair began, and there are definitely differences of power and status between them, over seven years it has merged into friendship. The story takes place on what will be their last day because Paul is getting married, but it’s also when Britain is on the cusp of change: the tragedy of WW1 has altered assumptions that people ‘in service’ will always be there to maintain the insouciant lives of the wealthy; women are about to get the vote; and women are going to enjoy much better employment opportunities. Jane’s literacy – a lucky accident arising from her unknown mother’s choice of orphanage – is the key to opportunities that she has the initiative to grasp. She becomes a writer. The story is told from her point-of-view, narrating the glorious sunny day that changes her life forever, looking back on her long life as the 1900s roll over towards the year 2000. We discover the point-of-view of other characters through the filter of Jane’s beliefs about people, social class and events, and though we may at times wonder if in her youth she entertained some naïvely faint hopes, they are balanced by the comfortable reflections of her old age. The narration by Eve Webster is pitch perfect, capturing the freshness of Jane’s youth, the sensuousness of the young people, and the canny humour of Jane’s later years as – when quizzed about autobiographical events by nosy interviewers at writers’ festivals – she keeps her secrets to herself. 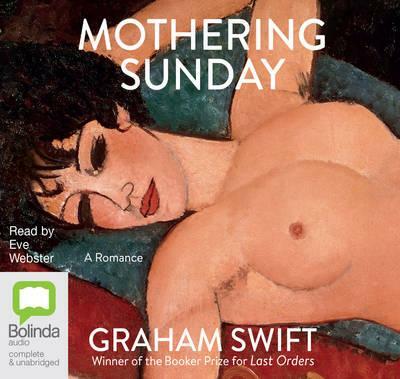 Only 3 CDs in length as an audio book, and under 200 pages in print, Mothering Sunday shows Swift using the form of the novella to meditate on the nature of truth in fiction. And if there’s any moral to the story, it’s that – in our tell-all society – there is pleasure and integrity in keeping some memories private. Source: Kingston Library, recommended by Simon from Stuck in a Book. (It was hard not to gush, but obviously I must have succeeded in that). I read his book: The Sweet Shop owner and liked it a lot. Does he explore class issues too in that one? Don’t you just love your local library! I have read the book but listening to it would be better, not that I would be good at that. I can see Mothering Sunday as a film. Oh yes, but how hard it would be to depict the ageing! I’m listening to a fair bit of audio books at the moment. This may be an option when I am trying to work out what’s next.